I feel like I have finally been to China, after 6 or 7 visits! 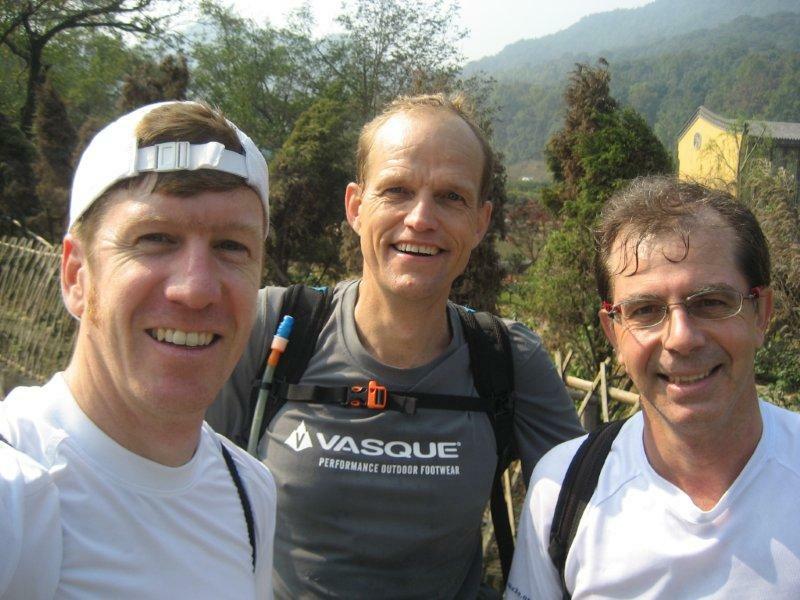 I had a Saturday free between work days and after Googling around for trail routes came across something called the Hangzhou Mountain Marathon – sounded like my kind of thing! The race is set for Saturday, November 19, 2011 so unfortunately 1 week later than I would be in Shanghai. But I managed to get connected to Nicolas Musy, the Race Director, and joined he and another expat runner, Doekle, for an epic trail marking / training run. Hangzhou (map | wikipedia) is a beautiful city about 1 hour by high speed train from Shanghai Hongqiao station. I booked the same train as Doekle, whom I hadn’t met before, yet we easily met up in the train station as we both stuck out like sore thumbs as tall white guys in outdoor clothes. After arriving, we met up with Nicolas and grabbed a cab to Shangri-la hotel where Nicolas and a friend were staying. We quickly changed into running kit, packed water and food, and grabbed a taxi (and spray paint) to head out to Longjing, a small town up in the mountains which is famous for producing the wonderful Longjing tea. 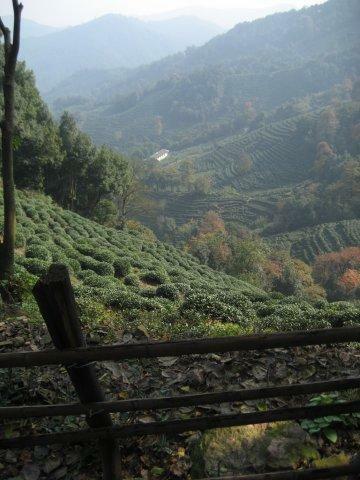 We were dropped at the edge of town, partway up the side of the mountain right at the edge of the tea fields. 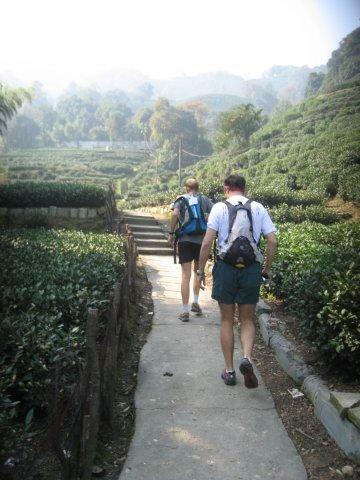 We were quickly ascending up into the mountains on dirt trails through stepped and perfectly manicured tea fields, and it was breathtaking in every direction. The views didn’t quit for the next four hours. 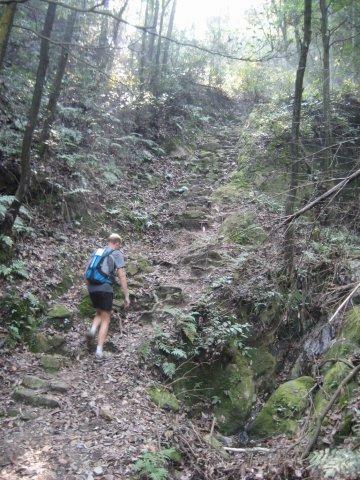 We summitted various peaks around Longjing and Hangzhou, and ran trails and saddles (sometimes as narrow as 2 meters) between them. Nicolas refreshed his course markings with bright green dots on trees and rocks, with 3 dots in a row to indicate a turn coming up. He lamented that they had been aggressively paving the trails in the area, so it was getting harder to mark a pure trail course – but I have to say the stonework was very beautiful. The weather was perfect – mid 50s and quite sunny which had been rare lately. Nicolas and Doekle were excellent running mates. 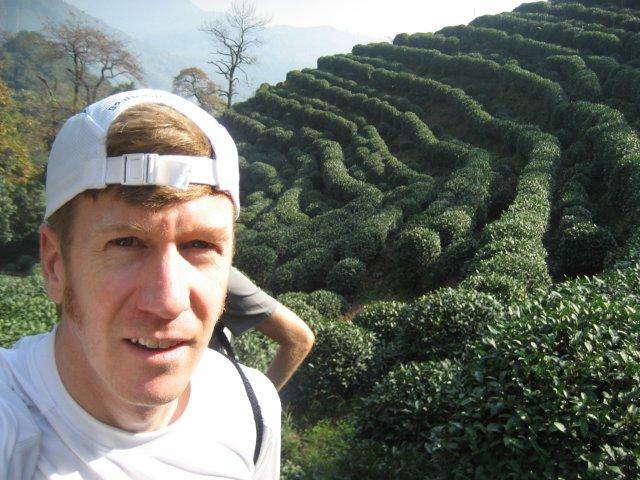 Nicolas has been organizing the Hangzhou Mountain Marathon for several years, and also the Mongolia Sunrise to Sunset 100k for even longer (13 years?). I had to laugh when I heard that – I remember learing about that race several years ago before my ultra days and sending it to some friends saying “can you believe this race!” Doekle has completed his first couple of ultras and is gunning for Mongolia next year – he will do great. I heard many tales throughout the day of their runs throughout Asia with the Hash House Harriers. We dropped into small mountain villages now and then, refueling as necessary and running down the cobblestone streets to odd looks. One young guy up in the hills even wanted his picture taken with us! Some parts of the trail are stone-paved, but the vast majority is awesome single track. 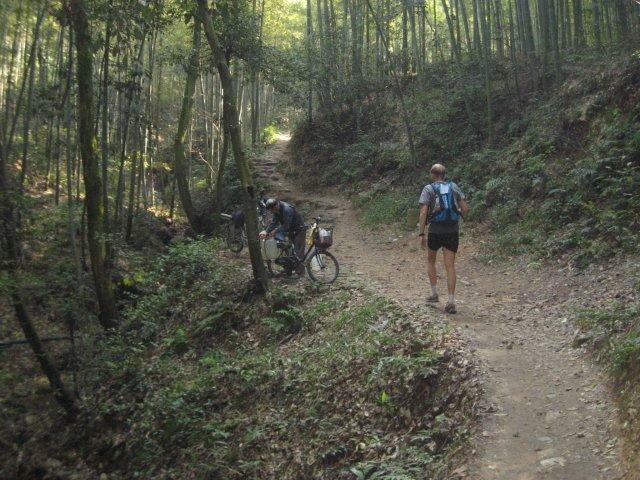 There are some crazy rugged climbs that reminded me of the Superior Trail, as well as serene flats that ran along creeks and through bamboo forests. 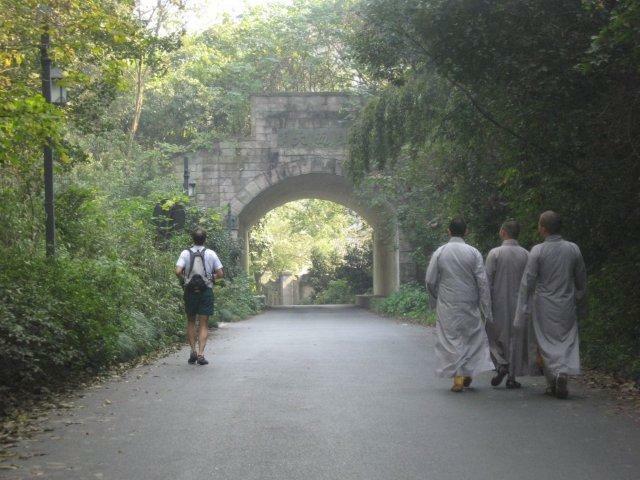 We ran by monks. We ran by people getting married. We even ran through a restaurant patio at one point! It was quite the adventure run. 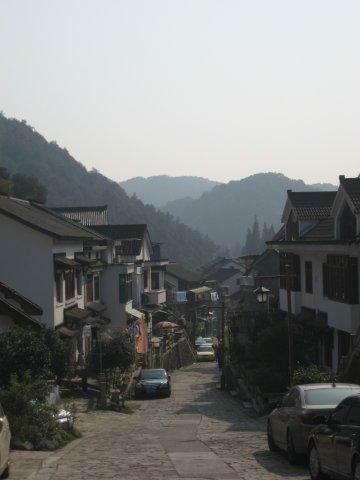 We finished by following the cobblestone trail called 9 Creeks that connects various small villages and ultimately finishes in the West Lake area of Hangzhou. 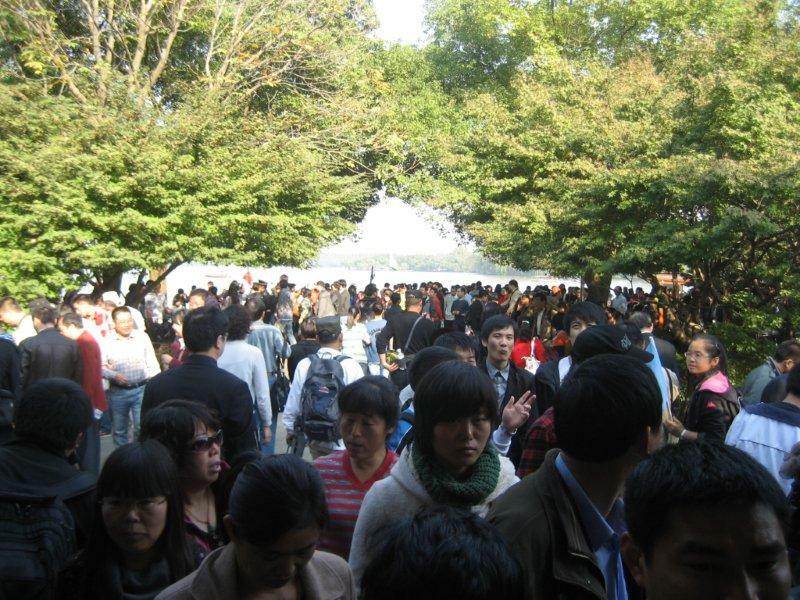 Hangzhou is immensely popular with Chinese tourists because of the beauty of this area, and we saw them in full force. Our last 4k were like running through a mosh pit – dodging through travel groups, bicyclists, inline skaters, and sprinted to stay right in front of (then immediately behind) and electric tram. 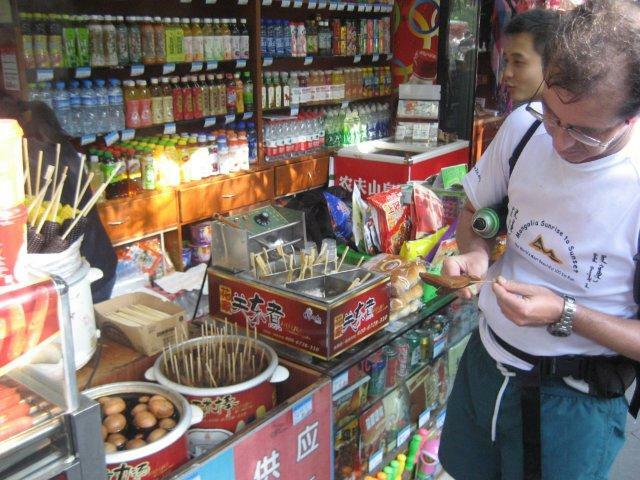 We stopped for tofu, and even took time to fill out a tourist survey! It was hilarious. All in all, we finished marking 20km of the course in 4 hours, which is a testament to the rugged nature of our route. Nicolas was kind enough to let us clean up in his room, then we enjoyed some Longjing tea and conversation on the balcony as the afternoon faded. We had a fantastic dinner at Shangri-la, then said our goodbyes and Doekle and I grabbed the train back to Shanghai. I tried desperately to stay awake and be good company for Doekle, but I sure I feel asleep a couple of times – sorry! If you happen to be in Shanghai next weekend, definitely check out the Hangzhou Mountain Marathon – it will be a fantastic event! Thanks Nicolas and Doekle for letting me join you, hopefully we can share the trails again sometime.